There's something special about a merry-go-round that brings out the kid in all of us. 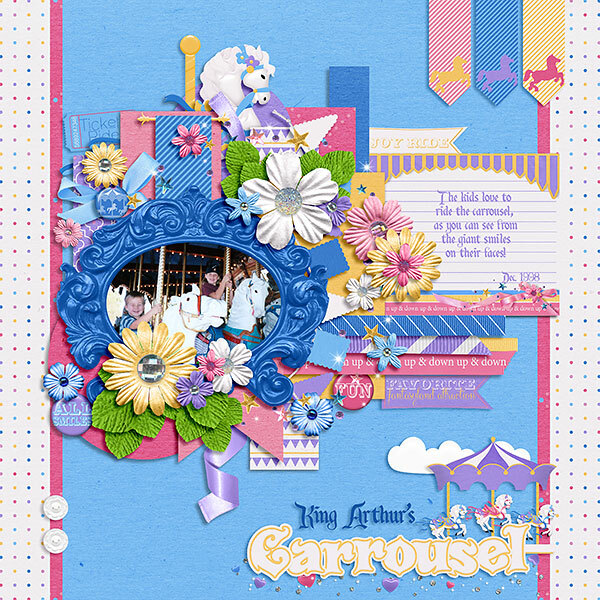 Maybe it's the carousel music, maybe it's the smell of cotton candy in the air, or maybe it's the joy of picking out that special horse to ride. Most everyone can close their eyes and come up with a precious memory of riding on the merry-go-round. 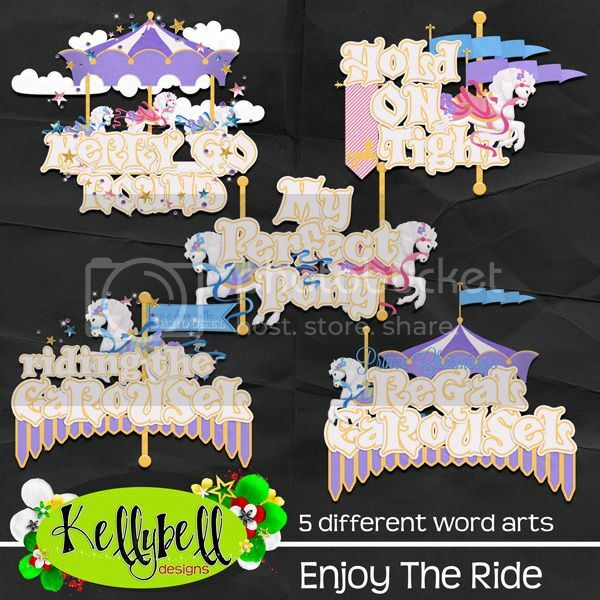 Kelly's new collection today is perfect for scrapping those special carousel memories. Take a look. Inside this lovely kit you'll find a carousel, carousel horses, flags, banners, pennants, sprays, cotton candy, balloon, buttons, clouds, lace, flowers, ribbons, maypole, hearts, frames and more. There are 15 papers in sweet patterns and colors. Plus you'll get a full white alpha in a regal font. You can also get the word art pack filled with 5 amazing titles. Or you might like the colorful journal cards. For premade packs, you can choose from the page starters or the layered paper stacks. Both get you expert clustered items to jump start your scrapping. You can find this collection inside Kellybell Designs Store for 25% off this weekend only. It's a beautiful kit and all the coordinating accessories are so pretty so make sure to load up your cart and purchase them at a discount this weekend. Want to see some amazing layout with this collection? You can view all the pretty CT layouts at Kelly's Blog or Kelly's Facebook page. Check out the page that I made. You've made it to the bottom of the post, now it's time to find out who's got the freebies today. Kelly's CT gals have some extra special goodies to share with you today. You can find them at the links below. Have a great weekend and have fun shopping and scrapping!